This article explains the BACKTRACK error message “The Multi-Part Identifier “USER.USER_NAME” Could Not Be Bound.” and details how to fix the underlying problem that caused it to appear. This is an SQL error. It indicates that BACKTRACK is having problems trying to connect to a field USER_NAME in the table USER. 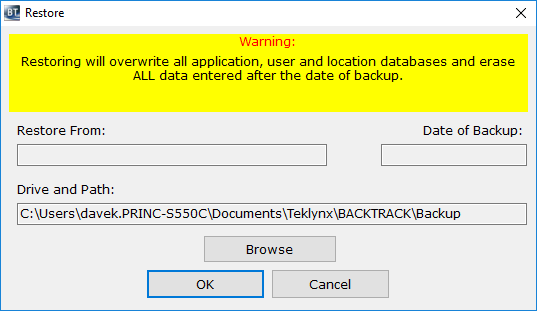 This error may point to problem with the SQL database or a program bug in BACKTRACK. If this problem occurs immediately after a database restore, it is likely that the restore failed and it left the database in a non-usable state. If you can, try restore again. If BACKTRACK is completely non-functioning, you will have to uninstall and reinstall the software (repair would not work) and perform the restore again.